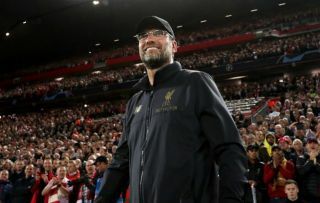 Liverpool manager Jurgen Klopp has responded to talk of him potentially managing Bayern Munich one day after the Reds’ win at the Allianz Arena in the Champions League. Klopp guided Liverpool to one of their most famous European nights with a superb 3-1 win away to Bayern last week to take his team through to the Champions League quarter-finals. The German tactician has long looked one of the finest coaches in Europe, winning titles with Borussia Dortmund in the Bundesliga before winding up at Anfield. After the win against Bayern, the legendary Franz Beckenbauer was quoted by the Liverpool Echo as talking up the prospect of Klopp one day managing the Bavarian giants. Still, Klopp distanced himself from such talk, without entirely ruling it out, though he hinted he’d like to be at LFC for a long time and end his career having not managed too long a list of clubs. “There is no bigger legend in Germany than Franz Beckenbauer, it feels great he speaks positively about me,” he said. “It is just like the king with his sword calling a man ‘sir’. “If he thinks that, it is a compliment to Liverpool. Bayern have done everything right in the last 10 or 15 years without making many mistakes but I feel I am a good fit where I am. “I love it here, there are lots of opportunities to develop an already really good team. I have enough confidence to say I am the right manager for Liverpool at the moment, though in football we all constantly have to prove ourselves. Klopp has a contract with Liverpool until 2022 and fans will surely want him to see that out and ideally stay beyond it if he carries on developing the team the way he has so far.